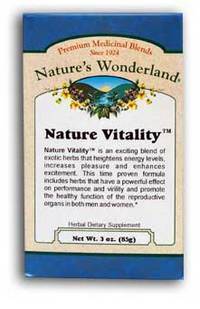 Nature Vitality® Tea, 3 oz (Nature's Wonderland) - Penn Herb Co. Ltd. Restore your sexual satisfaction and confidence naturally. Our super potent Nature Vitality™ formula is a blend of six libido-boosting herbs to increase your sexual desire, improve your sexual performance, enhance pleasure and extend stamina. YOHIMBE…African herb renowned for its ability to boosting performance and stamina. MUIRA PUAMA (POTENCY WOOD)…heightens libido and arousal. DAMIANA…supports hormonal balance and restores sexual energy. ALETRIS & SAW PALMETTO…supports reproductive health. Pour 8 oz of freshly boiled water over 1 heaping teaspoon of tea. Drink 2-4 cups daily. SEE PRODUCT LABEL FOR CAUTIONS.